“Trish, do you guys have an oven that works?” is a statement that can only end with a meal that looks like THIS. A couple of my guy friends came up with the invention of a French Fry Pie. 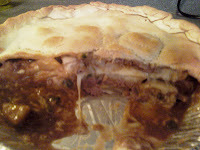 Yep, that’s right, a double crust with roast beef, scallions, steak fries, mozzarella cheese and gravy layered inside. Basically, an order of disco fries meets an open face roast beef sandwich in an epic battle for superiority. A short trip to the supermarket and this dream became a reality right in my own kitchen. I thought this was worth sharing as an example of how some things will never adhere to the Diet It Up philosophy. Sometimes, you just have to embrace a sliver of something as fattening and silly as a French Fry Pie. Life’s too short to miss out on these culinary experiments. Kudos to Sty and Mike for their bar food invention. YESSSZZZ! i wish i would have made this for my superbowl party! would have been a huge hit!